My dearest friends and readers, I have missed you. It seems like an eternity since I’ve been on my computer, on WordPress, typing away. First of all, I’d like to thank all those wonderful friends who have left comments on my Facebook, have chatted with me and sent me emails. I so, so, appreciate your love and thoughtfulness. It has been a busy summer for me. I celebrated the end of Ramadan in Houston because I really needed to see my family and to feel the comfort, love and support only family and close friends can bring. It was a bit of a sad Ramadan for me and I really wanted to trade my tears for smiles again. If you know me, you’ll know that I’m never without a smile on my face. My thought on this matter is that I just don’t have time to be in a bad mood. It takes entirely too much energy to be grumpy. We had a wonderful mini vacation to Houston, San Antonio and Dallas-Fort Worth. It was exhilarating to be with family again and laugh too much, eat too much and sleep not enough! I came back energised and ready to get cooking, baking, photographing and blogging. At least that was the plan. Ever since I’ve been back, happy busyness has been keeping me otherwise occupied. The end of the summer events have been keeping me busy as far as cooking goes, I had a few dinner parties that went fabulously and I’ve also been working every Saturday as the Thermador cooking demo person. In all this busyness though, I have missed one thing, my blogging friends, my lovely readers and I’ve missed the friendship that only a blogger knows. It was time to come back. I, honestly, still don’t have time to cook and my family has been sorely neglected. I may be on the brink of a mutiny. But I manage to get food on the table; whether it is edible or not! Since I cook every week on Saturdays for Thermador, I am going to start featuring those recipes until I can find a break to do my own blog cooking. I will tell you now, to excuse the bad photos because of the lighting in the showroom. So, onto this Heirloom Tomato Pizza; it was supposed to be a tart. When I was heading off to the showroom for the demo, I left the tart shells in my freezer. Yep, big fail. However, I was also making a BBQ Chicken Pizza that day and had two rounds of pizza dough. I figured that a pizza was just as good as a tart, and you know what? It was pretty darn delicious. 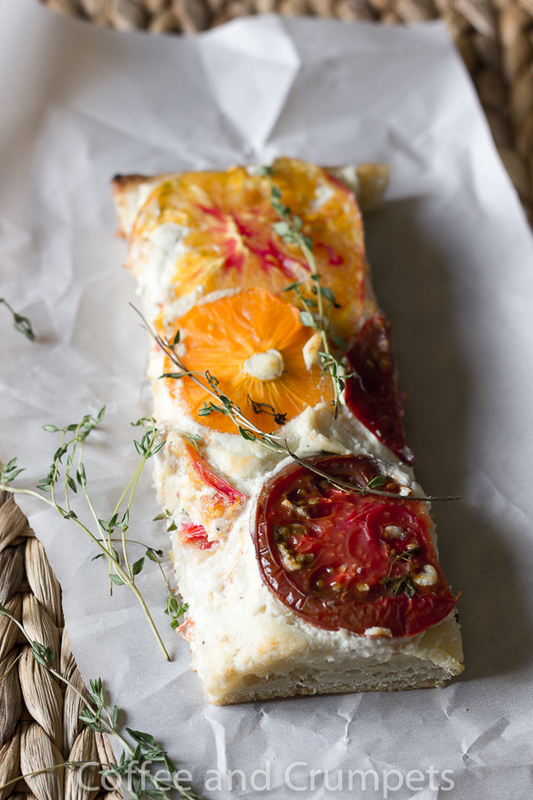 A creamy, ricotta and mascarpone cheese pizza topped with seasonal heirloom tomatoes. There are many ways to make pizza dough. Add the warm water, 1 cup first and then drizzle as necessary. Let the mixer do the work, knead and become nice and smooth. Place the dough ball in a greased bowl abc cover with a towel to rise. About an hour at sea level but about 30-40 minutes at altitude. However, when I do this, I know my yeast is fresh and will rise. If you are unsure of the quality of your yeast, then let it proof with the water and sugar until light and fluffy. Then add to the flour, olive oil and salt. While the dough is rising, work on the tomatoes and the cheese mixture. Slice the tomatoes in a ¼ inch slice. Mix the ricotta and mascarpone together, add the thyme, salt and pepper. Be generous with the salt, but taste to ensure you don't over salt! Once the dough has risen, spread out the dough into a large sheet pan, I used a half sheet size. You could also divide the dough into ¾ pieces and make individual pizzas. Smear the cheese filling all over the dough and arrange the tomatoes over the top. Sprinkle a few thyme leaves but reserve some to place on top after baking. 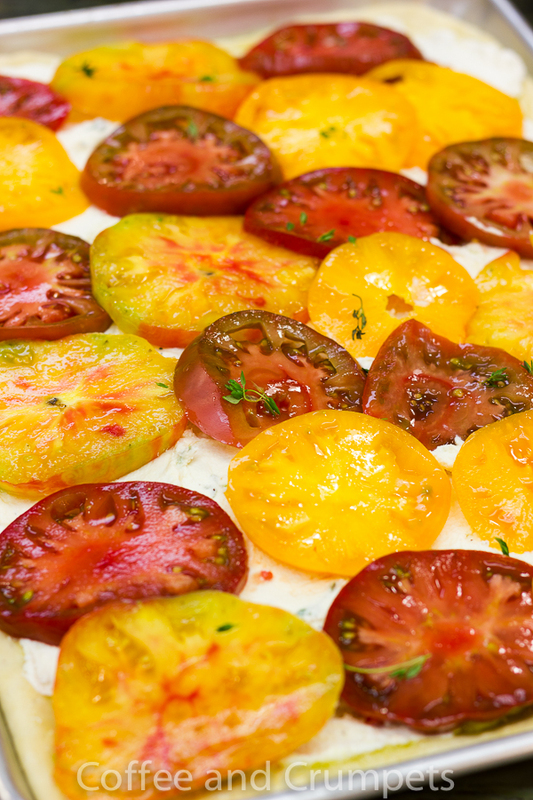 The tomatoes should be shrunk slightly and the crust and cheese lightly browned. Pull out of the oven and let cool a little before slicing. So, this was the first time I made this and though I usually like to try it out a couple of times before posting, I thought it was very good like this. I chose to use ricotta and mascarpone because I don't like the graininess of ricotta cheese. I figured, mixing a bit of mascarpone would tame the gritty feeling and sure enough, I got all creamy and not grainy. Creamy is good and this was really very good with the tomatoes being the star. However, I think a tad drizzle of garlic oil or even basil oil could elevate this even more. Maybe even an addition of a garlic clove in the cheese mixture could zip it up a bit. But like I said, it is very, very good as is. I just have a tendency to not leave things well enough alone. 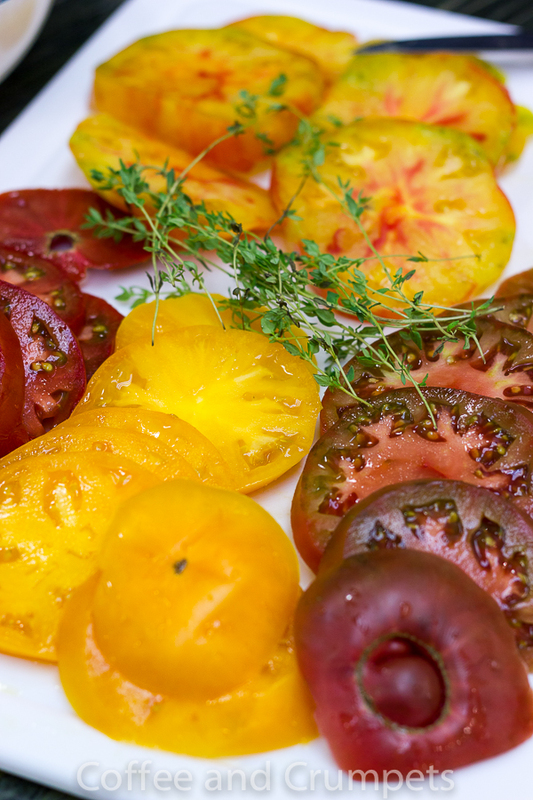 I hope y’all have had a chance to try some heirloom tomatoes this season. They are so pretty and quite delicious. I wish you all a very happy and productive week. I shall be by to visit you all very soon. Thank you for your patience, love and support! This has to be the most beautiful summery tart! Definitely delicious and worth to try tangy tomato pizza recipe!! pretty damn beautifully captured too…. Without the moisture, these little tomatoes had me thinking you made a peach or pineapple tart! Either way, HALLOOOOOO and welcome back Nazneen. You’re radio silence was noticed and missed! Is that your way of telling me I talk too much?? You know me so well 🙂 Feels good to be back and especially wonderful to hear from friends! Thanks Fran! Welcome back my dear! It’s great to read about you again… I hope you had good time with your family. The coincidence, I’ve just posted a very similar recipe… have a great we and keep in touch! 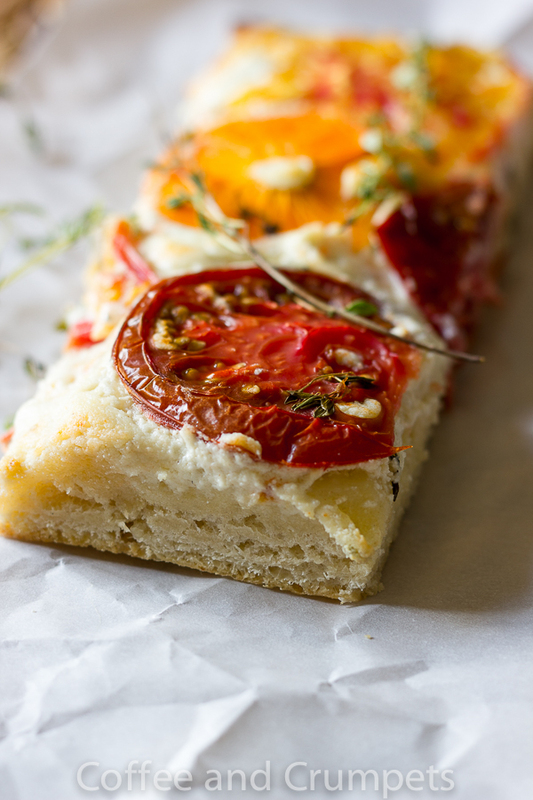 Margherita@lapetitecasserole recently posted..Focaccia stuffed with ricotta. Welcome back, Nazneen! I missed you and your wonderful posts. I love pizza and your heirlooms tomato pizza look so pretty! Thank you so much Balvinder! It feels good to be back with friends again. Thanks for stopping by, I really appreciate it! Soooo good to have you back! Its wonderful to know that you had some great time with family and friends. They are such huge blessings from God. Thank you so much!!! So happy to see a comment from you my friend! I’ll be by to say hi soon! Thank you so much!! It was a much needed break and I feel great now. Hope you’ve been well Denise! Nazneen, I was just thinking about you yesterday and wondering how you were doing. So glad to see this post from you this morning. And your photos are just as beautiful as ever. This pizza look incredible. This pizza looks befitting royalty, so fresh and delicious! Hurray! You’re back! It’s awesome to hear from you again. Really really missed your posts and your presence in the blog world. And glad that you got a well-deserved break. Things have been busy at my end too with all the house moving etc Your pizza looks amazing as usual. 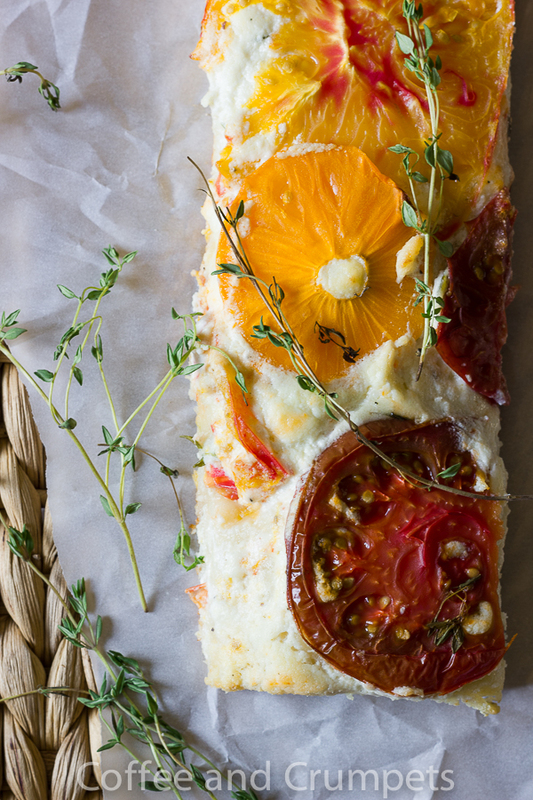 I can’t wait to get hold of some beautiful tomatoes to make this. Stay in touch…DO NOT disappear again! Love. Oh, look who is here?!!! I’ve missed you so much my dear but I’m happy that you’ve spent this time very well , had fun and filled your heart with the warmth of family. Your pizza is very colorful and looks great. Thank you Angie! Yes, they are beautiful and so delicious! Welcome Back Mrs Thermador cooking demo person!!! So good to see you back Nazneen!!! So glad you had such a wonderful time with family and friends! 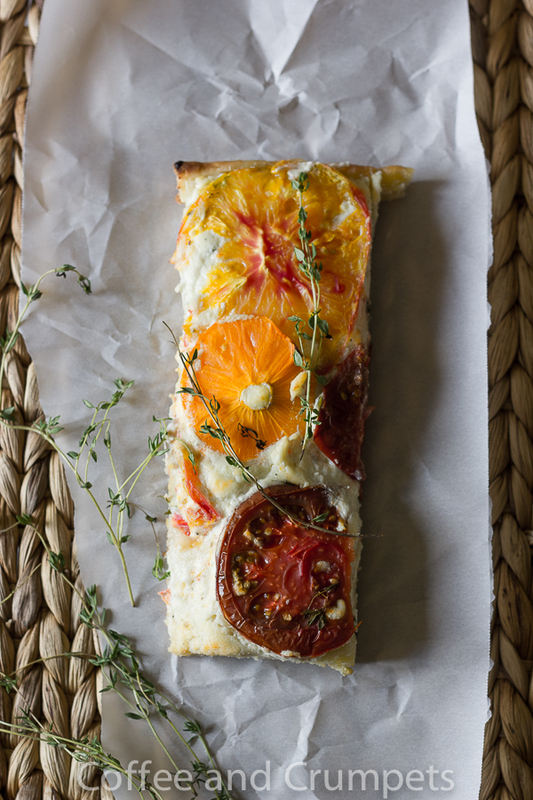 And what a way to come back – this pizza is gorgeous (the pictures stunning) – those fresh heirloom tomatoes are mouthwatering! Thank you Shashi! Feels good to be back amongst good friends! See you around my friend! Welcome home! Er, I mean, “Welcome back!” I think your idea of blogging on your Thermidor adventures is a great one. And this pizza was a great start! I might just turn it back to a tart this evening, as I have some homemade puff pastry in my fridge that needs using. 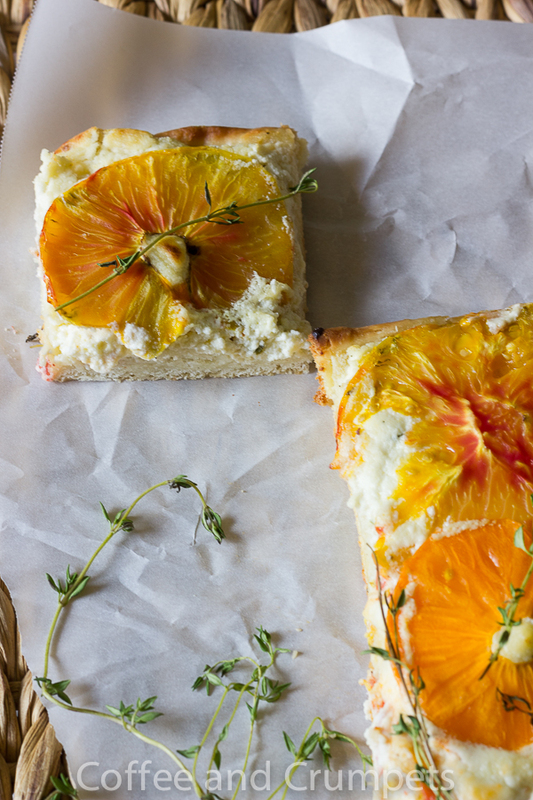 Love the combo of ricotta and mascarpone! So glad to see you in my inbox this morning…. Awww, thank you so much my dear friend! It feels good to be back and to be with friends again 🙂 I hope you try this with your puff pastry! I bet it’ll be wonderful! Yey, you’re back! And what a comeback – a nice, lovely pizza with lots of cheese! Yum! BEAUTIFUL photos Nazneen! This sounds like a perfect way to use up all those beautiful heirloom tomatoes I have rolling around in my vegetable crisper. Glad to see you back to blogging. Thank you so much Karen! I feel a bit rusty with the camera so I’m glad you like the photos! I missed you and your posts SO much! So glad to see you back and in action! Thank you Henna , my friend. It was time for me to come back, I miss this!